About 10% of the world’s beer kegs are lost or stolen each year from incorrect deliveries and insecure storage outside bars. Binary Beer’s 'Smart Keg' tracking device aims to reduce this loss while ensuring stale beer is never served by tracking kegs throughout the supply chain and alerting brewers and bars when their beer is stored incorrectly. 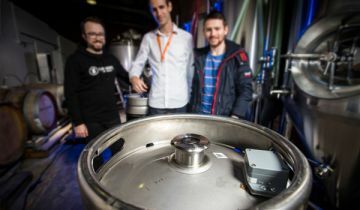 After receiving a $25,000 Minimum Viable Product grant from Jobs for NSW, Binary Beer was able to run a trial with local brewing company Five Barrel Brewing Co to gather results from their sensors in a real-world environment. By incorporating these results into their product offering they have now attracted institutional investment, bringing the company’s valuation to $1 million. Minister for Small Business John Barilaro said Jobs for NSW’s most important contribution was non-financial. “Binary Beer was initially focused on the niche home brewing market when they participated in Bridge to MassChallenge, a competition for startups backed by Jobs for NSW,” Mr Barilaro said. Binary Beer was one of ten Australian finalists selected to go to Boston for the Bridge To MassChallenge programme in February 2017, where they received coaching and mentoring on running a startup business while tapping into the expertise of Boston’s large craft brewing scene.Following this, the company was invited to join iAccelerate, the University of Wollongong business incubator supported by the NSW Department of Industry, where they further developed their value proposition and Internet of Things (IoT) technology. Co-founder of Binary Beer, Michael Burton, said his company then received the Minimum Viable Product grant from Jobs for NSW, which helped them test their system with a local craft brewer. “It allowed us to iron-out problems such as tracking the kegs in cool rooms that are surrounded by metal, which block electromagnetic waves,” Mr Burton said.